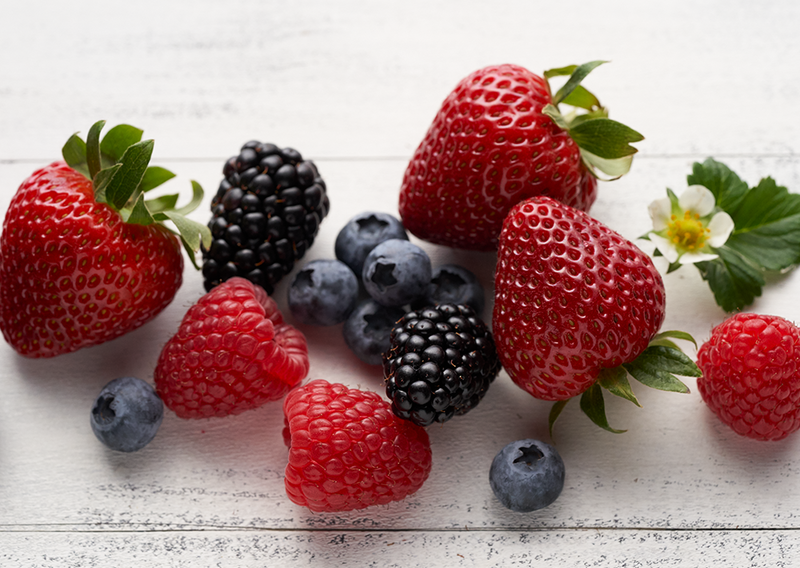 Berries, particularly strawberries and blackberries, are bursting with Vitamin C. This essential vitamin plays a key role in many bodily functions – from the healing of wounds to improving cognition. Best known for its role in boosting your immunity, it’s a physiological antioxidant, too. Berries contain a decent dose of this fat-soluble vitamin, which acts like an antioxidant to help protect cells from the damage caused by free radicals. Vitamin E is also an immune-booster to help your body fight off invading bacteria and viruses; and is great for widening blood vessels and minimising risk of blood clots. Vitamin K helps your blood to coagulate or ‘clot’, so you’re not at risk of excessive bleeding. It also plays a key role in children’s growth and development. A serve of raspberries contains 15% of the RDI of Vitamin K, while blackberries contain a massive 37% of the RDI. The rich pigmentation in berries is a clue to the high levels of phytonutrients within. Phenolic acids, flavonoids, tannins and more are powerful antioxidants that help to fight free radicals and protect you against cardiovascular disease, cancer and cellular ageing. Flavanoids like anthocyanins are particularly abundant in berries. These flavonoids have been researched for their anti-cancer, anti-inflammatory and anti-ageing effects; and have also been linked with health benefits like improved eyesight, preventing urinary tract infections and more. A cup-full of berries may provide more than 20% of the daily needs for manganese. Your body needs manganese to regulate muscle and nerve function, absorb calcium, and breakdown carbohydrate and fats. It plays a key role in maintaining healthy bones by transporting the calcium in your diet around your body.